Have you been to The Misadventures of Mama and Jack? I love that name! Sarah's blog has that simple, pure and clean feel to it. 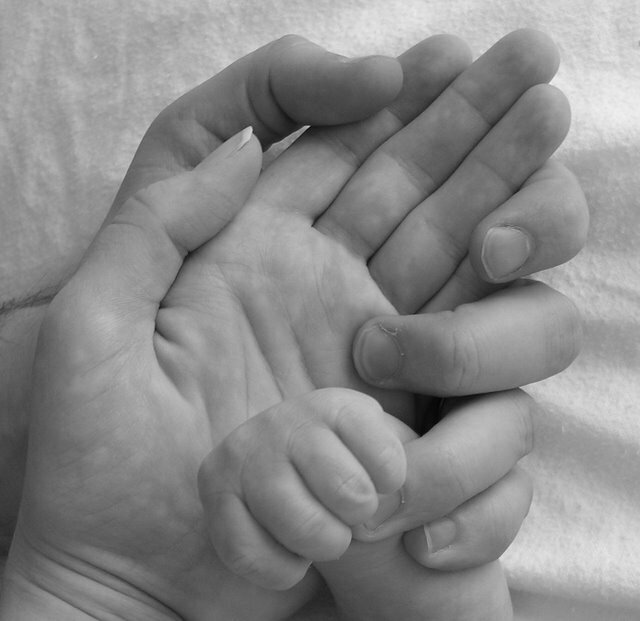 I have really enjoyed reading through the archives and watching Jack grow up. Such a darling little guy with his red hair and cute cheeks. In her spare time Sarah crafts. She thrifts. Sarah is a true queen of flea markets, yardsales, etc..... I thought I was pretty good, but she is way more dedicated than me. Look at the sweet dresser down below.......... She found that! The post that goes with this photo, she breaks down what everything costs and where she got it. Well........you know I loved that. I'm tellin ya.........us thrifty gals wear the bargain prices like a badge! I get the idea that Sarah is pretty organized. 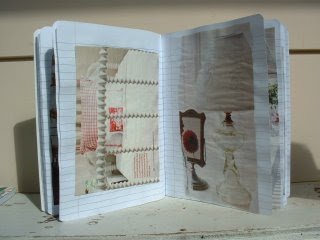 She has made this little book to keep her ideas in. What a great idea. I really should do that. 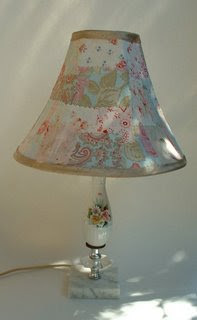 I saw this lamp idea on TreeFall......she's an earlier feature.........But Sarah takes it one step further. She gives us a tutorial. I can't wait to try this. Another project to add to my list. I should have paid attention in my home ec. class in 8th grade. That is the last time I actually sewed. Dang, dang, dang! 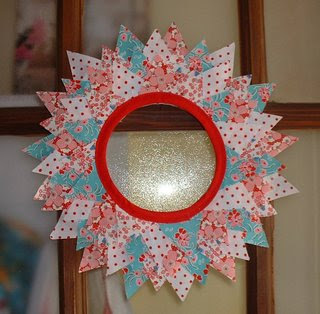 I would be a storm of creativity if I also could create magic with fabric.........Look at these cute wreaths? I don't know about you, but I have never seen anything like that before. How cute would that be hanging on a door or wall? 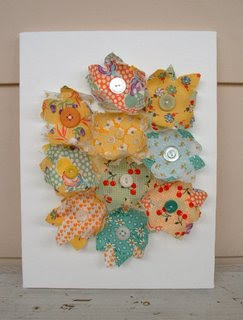 And these cute little flower things below with the buttons? I really really like these. I would love to put them in a shadow box and hang them. 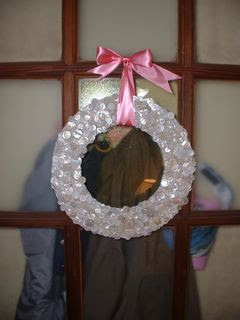 And this sweet wreath. So so cute. 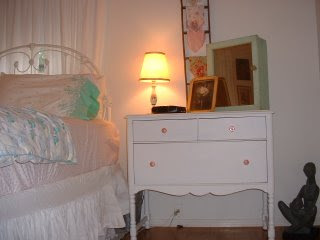 You could use that all year round in a shabby chic room, or for multiple holidays. I'm getting all kinds of ideas and I have LOTS of buttons. Watch out! Sarah's blog is another fun and easy read. You feel very comfortable with her. She's funny, cute and shares Jack with us. Can't wait to see more Sarah! I love this blog!! If you want to see cute, go to October 2006 and see little Jack in his googly glasses! I, too keep an inspiration binder. It really does keep you on track with things you want to do. It's great for forgetful types like me!! WOWIE! I am loving those wreaths! Going to check out the blog now. Thanks for the heads up on great blogs! I got another for ya- redvelvetcreations.blogspot.com. She makes visual anthologies and they are amazing. I would like to see her get some more recognition. I also keep an inspiration notebook. In fact, I just posted about in recently on my blog.